Venezuela expelled the top U.S. diplomatic officials in the country on Tuesday after the Trump administration increased sanctions on the South American nation. 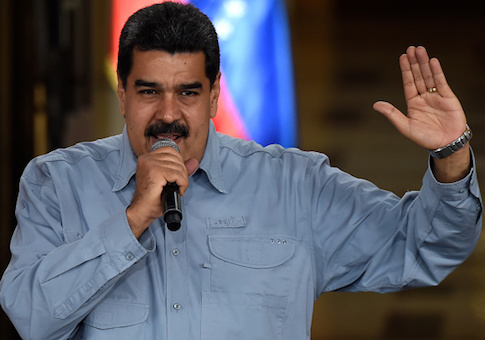 President Nicolas Maduro declared victory Sunday in what critics called a sham election, one in which several opposition parties were banned from running. The United States and several of Venezuela's Latin American neighbors had threatened Maduro with sanctions if he went through with the vote. On Monday, Trump followed through on that warning, banning U.S. citizens or companies from buying debt from the Venezuelan government, but stopping short of threatened sanctions of Venezuela's lucrative state-owned oil industry. In response, Venezuela gave chargé d'affaires Todd Robinson and his deputy Brian Naranjo, the two highest-ranking officials at the U.S. embassy, 48 hours to leave the country. In a televised address, Maduro called Robinson a persona non grata and accused him of "conspiring" against his government. The expulsion comes after Maduro previously kicked out the top Brazilian and Canadian diplomats in December and the Spanish ambassador in January after the European Union voted for additional sanctions. In those cases, Maduro also accused the diplomats of interfering with his country's internal affairs. Blaming foreign influences is a common refrain for Maduro's government, which has failed to stop Venezuela's out-of-control inflation and widespread starvation. This entry was posted in National Security, Politics and tagged Donald Trump, Nicolas Maduro, Venezuela. Bookmark the permalink.